On Friday, the Florida State League announced rosters for the 2010 FSL All-Star Game to be played at Space Coast Stadium in Viera, Fla., on Saturday, June 12, 2010, at 7:35 p.m. ET. The top two pitchers in the league in ERA -- Bradenton's Bryan Morris and Fort Myers' Kyle Gibson have been promoted -- but Tampa's Adam Warren (6-3, 1.93 ERA) is on the North roster. Top Blue Jays prospect Henderson Alvarez (5-1, 2.42) of Dunedin joins Daytona's Rafael Dolis (3-3, 2.34), Lakeland's Charlie Furbush (3-3, 2.73) and Tampa's Hector Noesi (5-2, 2.72) on a pitching staff that will make runs hard for the South to come by. The South has its share of strong arms, led by Bradenton's Nathan Adcock (5-2, 2.50). St. Lucie's Manuel Alvarez hasn't allowed an earned run out of the Mets bullpen in 25 2/3 innings. He's seen similar success in his last three outings in Binghamton and may not be with St. Lucie when the game is played on June 12, but he's a deserved All-Star selection nonetheless. Phillies prospect Cody Overbeck leads the Florida State League in home runs with 11 and RBIs with 38, so he was an easy selection to the North infield from Clearwater. The North also boasts the No. 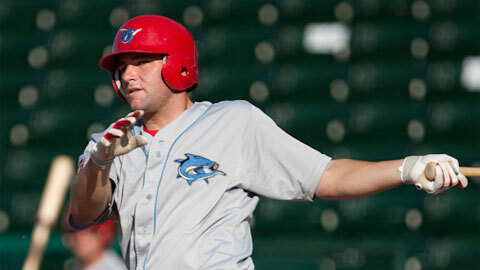 2 and 3 batting leaders in the FSL in Rawley Bishop (.341 batting average) and Kody Kaiser (.339), both from Lakeland. The South offense is led by Bradenton's Jeremy Farrell, who is second to Overbeck with 23 extra-base hits. The fourth overall pick in the 2009 Draft, Tony Sanchez, is one of three catchers for the South. The Marauder's .316 batting average and .423 OBP show that Sanchez was reading for his first go-round at the Class A Advanced level. Charlotte's Isaias Velasquez and his 18 stolen bases will add speed to the North lineup. The coaching and training staffs from Tampa (North) and Charlotte (South) will direct their All-Stars from the dugout at Space Coast Stadium. [* Editor's notes: On June 3, the league announced that Jupiter infielder Ben Lasater would replace Palm Beach's Jose Garcia, who was promoted to Double-A Springfield. On June 4, the league announced that Dunedin pitcher Matt Daly would replace Hector Noesi, who was promoted to Double-A Trenton. Charlotte pitchers Nick Barnese and Joshua Satow and Palm Beach pitcher Matthew Frevert will replace St. Lucie's Chris Schwinden and Manuel Alvarez (both promoted to Double-A Binghamton) and Fort Myers' Bobby Lanigan (injured). On June 7, the FSL announced that Brevard County pitcher Wily Peralta will replace Bradenton's Nathan Adcock on the South roster. Charlotte pitcher Marquis Fleming will replace Lakeland's Charlie Furbush. On June 9, Lakeland's Gustavo Nunez was added to the North roster in place of Dunedin's Tyler Patornicky, who is on the disabled list. Brevard County's Michael Fiers replaces teammate Wily Peralta, also on the North team. For the South, Palm Beach pitcher Mark Diapoules has been selected to replace Charlotte's Nick Barnese. Brendon Desrochers is an editor for MLB.com. This story was not subject to the approval of the National Association of Professional Baseball Leagues or its clubs.